So the rear pivot is 2.5mm wider per side? Are the arms slightly shorter or does the new rear hub make up for the difference? still hate how kyosho bodies run the nose peice through the shock tower, i always cut it off to not have to fight with it or end up tearing the body. Well I stand to be corrected. The arms are solid. Lots a new stuff. Rear plastic hubs....yuck! HA chassis that’s notched for clutch bell strike. Nice. Anybody got a price for this bad boy? Plastic hubs more in line with other car offerings; I suspect to lower the price and make it more attractive to the folks who always complain the K-cars are too expensive (compared to others). I like it. Quick change diffs are nice, but it thins out the strength of the A and D suspension mounts on many cars that have them. Apart from the diffs, gear boxes, and fuel tank, most of the car has changed so calling it a MP10 is justified imo. Also like how the arms are beefed up. Price wise, I think it'll be about the same. yeah it doesn't come with the alum rear hubs, but the chassis is hard anodized and the costs to make the new molds will off-set it. So can we assume the rear aluminum tki4 hubs will work on this car? The D mount is 5mm wider now, and the new arms do look a little shorter, so maybe it will work. 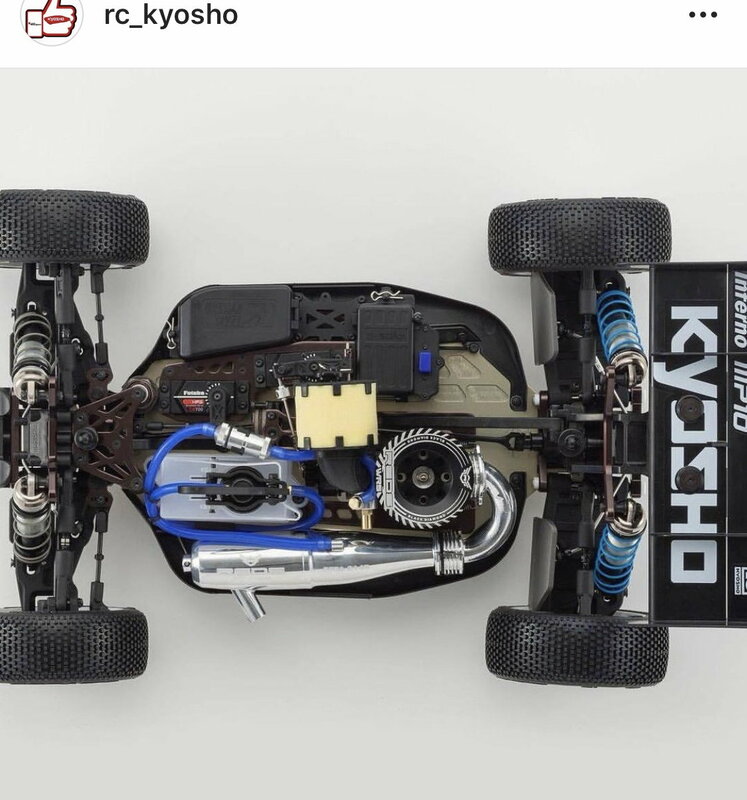 IMO had Kyosho not changed the position of the notches in the B and C plates a TKI4 could have been updated to this new model for less than $100, if you leave out the gonzo body. The changes look nice but there’s no changes to steering geometry. For example no changeable Ackerman on the knuckles and retention of the widely rejected TKI4 knuckles (I like them). Flip the steering plate and add truggy steering links and you’ve got the MP10 steering update. Run TKI3 front arms and outside pills and you have your wider pivot. Dremel the notches or drill the chassis and there’s not much to add to update a TKI4 - basically arms and plates, the other stuff looks cosmetic. It appears that the CG has been moved forward. If you look at the front center universal it is 2mm shorter, and the rear center universal is 6mm longer than the MP9. Depending on other design features this would potentially move the center diff assembly and motor further forward on the chassis. If true, this is probably the biggest single game changer between the MP9 and MP10. This should provide more steering. This is also why a new chassis part number was required. Are the shocks longer? They’re mounted on the outside arms, front and back, and it looks like there’s a ton of droop. What did they leave the engine cooling head screws out, lol . Nice to see those new Futaba Servos exist!! !